The Midnight Review: Which Is It: Crypto-Muslim Or Black Liberation Christian? Which Is It: Crypto-Muslim Or Black Liberation Christian? 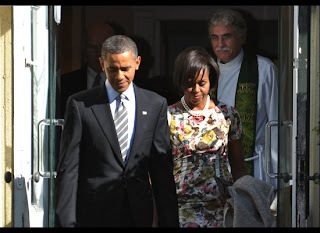 Here is a picture of the president and his family leaving church on Sunday, so my question to the right-wing teabag fanatics is what is Obama's faith - is the president a Muslim or a black liberation Christian?